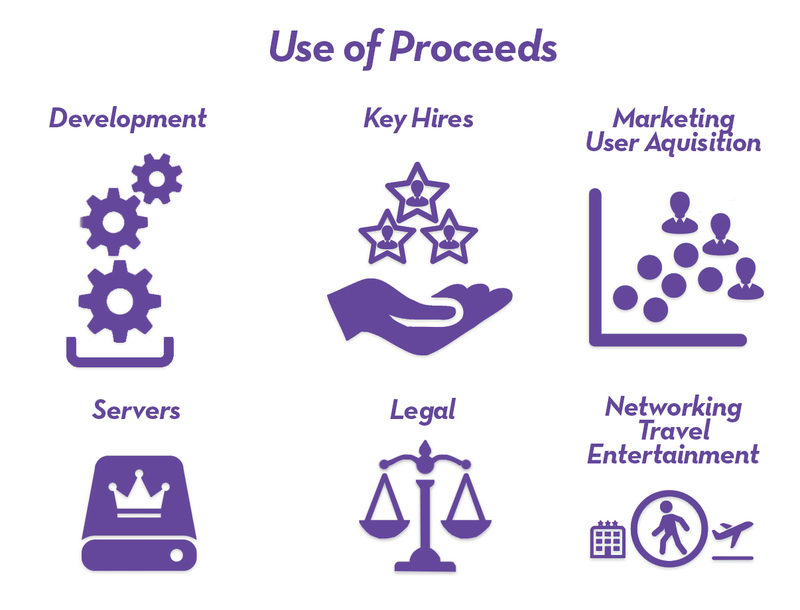 The funds raised in this offering are designed for maximum growth: key rockstar hires, development and server support, targeted user acquisition marketing to compliment our strategic partnerships, and legal fees. Stubbs Alderton & Markiles, LLP is one of the leading start-up law firms in Southern California. They pioneered a fixed fee start-up package making the formation and organization of your start-up as seamless as possible. Their Preccelerator Program is a new platform offered to select start-up companies out of their Santa Monica office that provides interim office space and sophisticated legal services, with the objective of helping you grow your idea from business concept to funded startup. The Preccelerator Program provides free co-working space and other perks for 5-6 promising young startups. Prior to Co-Founding Swggr, Yuri was a Principal at Phalanx Interactive, a premier sitecore services agency based in Los Angeles, CA. There he managed their client pipeline and led its product development team overseas. He's since combined his passion for Tech & Fashion to create Swggr. Yuri studied Economics at Wheaton College. 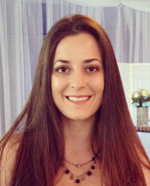 Yuri is a 2-time Collegiate Soccer All American, who went on to play professionally in South America. 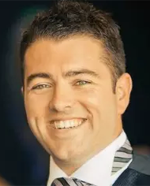 Brian is a 16 year brand licensing and business development veteran, having rolled up consumer products programs on behalf of leading Fortune 500 and Entertainment brands in nearly every class of trade, achieving over $500M in retail sales. Before joining Swggr, he was Vice President of Consumer Products Worldwide at Paramount Pictures where he led an 18 member team, set and implemented global strategy, and brokered deals with Dolce & Gabbana, Marchesa, Wildfox, and H&M, among others. 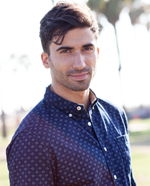 Marco served as a core developer for a leading mobile tech company. 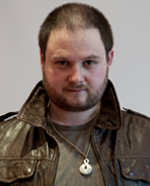 He works with app development teams in Auckland, New Zealand and completed over 60 fully-developed apps. 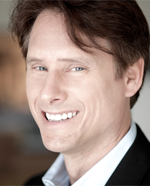 His teams have developed and launched apps for many Fortune 500 companies. He is deeply experienced in the mobile app industry with expertise in developing complex backend infrastructures and servers. 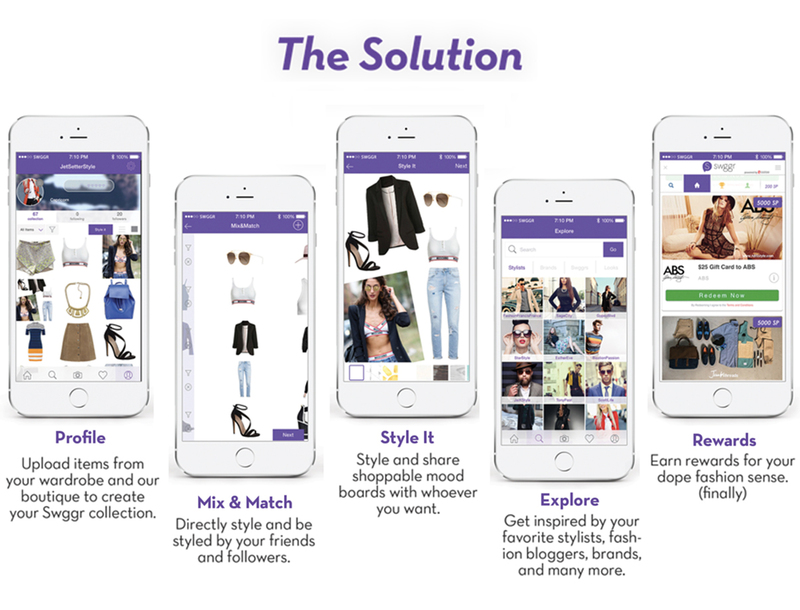 Ysis has launched five mobile sites and two apps in the last year alone. She is responsible for overseeing the full project life-cycle, from initiation through closing for iOS/Android apps, mobile and multi-channel projects for Fortune 500 clients across booking, retail and self-service verticals. Ysis managed the full project life cycle of Virgin America, T-Mobile, Trip Advisor, and BlackHawk, among others. 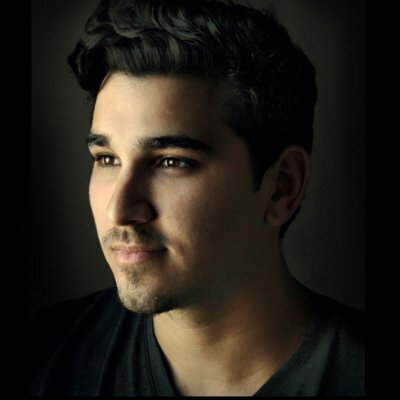 Raz Miyara is a young, LA born graphic designer with a background in marketing and creative design with over 5 years of professional experience ranging from apparel design to application development and everything in between. Brian Lucey has managed the lifestyles of high-net worth clients and provided them access to major events including every global Fashion Week, Sundance, Cannes, and Art Basel among others. Ariel Stepp has run celebrity campaigns for Toyota, Equinox, Arclight Cinemas, and Britney Spears private events, working with talent including Gwen Stefani, Tony Hawk, Christian Slater, Jon Hamm, Kim Kardashian, Selena Gomez, Keanu Reeves, and Kelly Osbourne. Together they form Lucey Stepp, a marketing firm that provides brands with celebrity seeding, brand activations, experiential luxury events, social media placement, and brand integration. They have produced campaigns and events for brands including Rolls Royce, Baumvision, MTG Skincare, GoPro, Ilan Hall, Radical Studios, Art of Elysium, Northrop & Johnson, their work has been featured in Variety, Wall Street Journal, People, The Hollywood Reporter and The New York Times. Jake Denny joined the digital world as the music industry was undergoing significant change. In addition to overseeing digital marketing efforts for Capitol and Virgin Records, Jake worked closely with Apple on launching the iTunes Store, global carriers and device manufacturers (OEMs) to distribute and monetize content across the web and mobile. Long before the App era we enjoy today, Jake helped companies like 5th Finger, nineMSN (Microsoft), Big Mobile and Tapjoy deliver award winning mobile campaigns, and developed mobile strategies for some of the biggest brands in the world. 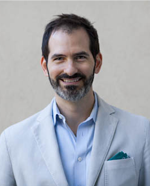 Jake continues to be a thought leader in mobile advertising and mobile marketing, and is currently the VP of Sales for The Mobile Majority, one of the fastest growing ad tech companies in LA. Ken is the Host, Co-Founder, Co-Owner and President at Business Rockstars. He is also the Founder, President and Host of KenRadio Broadcasting which is syndicated on CBS Radio. In addition to these accomplishments, Ken is the founder of the Media, Entertainment and Technology Alliance known as Metal. Jason was the Creative Director for Joe Fresh, a $1B brand launched by Club Monaco founder Joe Mimran, where he oversaw strategy and execution of all Marketing & Advertising, Promotions, Digital, and In-store signage. Prior to Joe Fresh, Jason held senior Art Director posts at J.Crew, Banana Republic, Ann Taylor, and Tear Sheet Magazine which he co-founded. 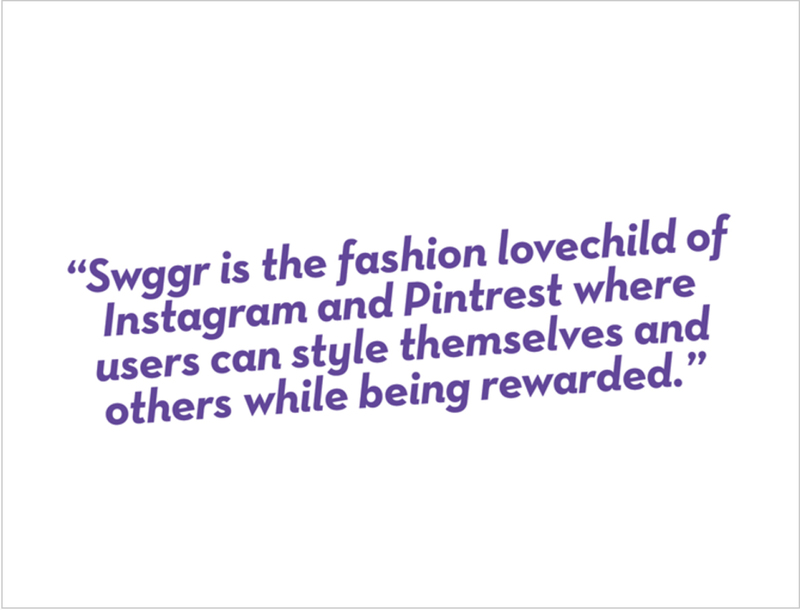 Swggr, from the fashion term swagger, is an attitude, a playful expression of confidence for millennial women and men, much like Uber is of luxury. 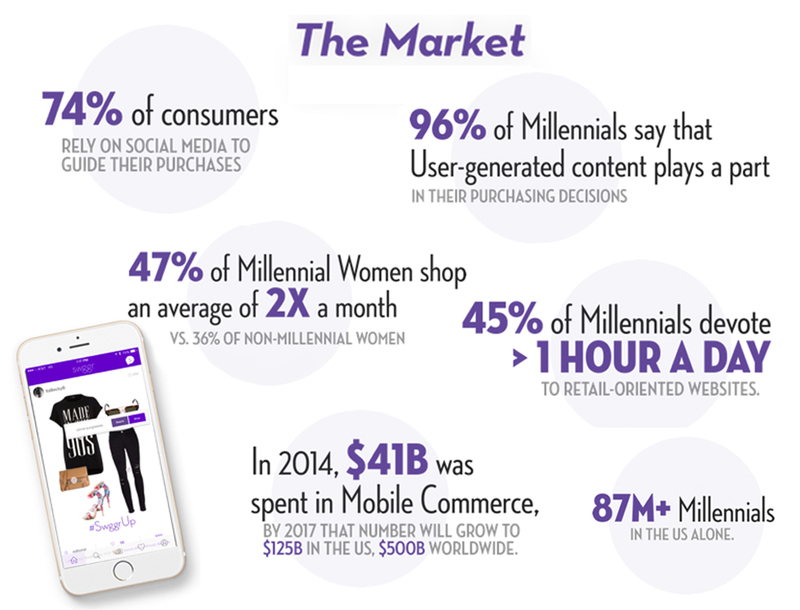 Primarily female and secondarily male millennials (14-32), label savvy, tech social with an appetite to forge deep connections with their favorite people AND brands , inspiration seekers, influencers, mini moguls-in-training, risk takers who can pull things off because they take their style more seriously than they take themselves. And the people who want to join their party. How will you attract users? What is your go-to market strategy? 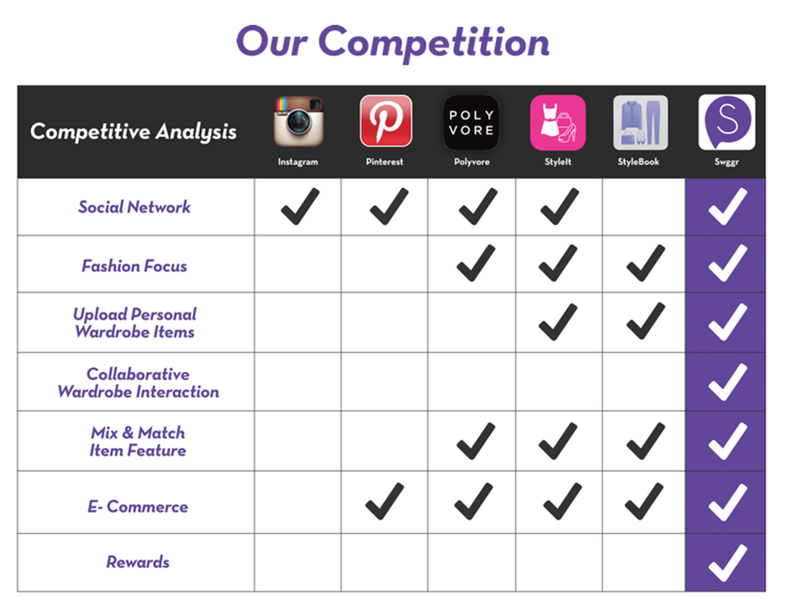 We have a four pronged approach built upon digital advertising, influencer marketing, strategic partnerships, and PR. 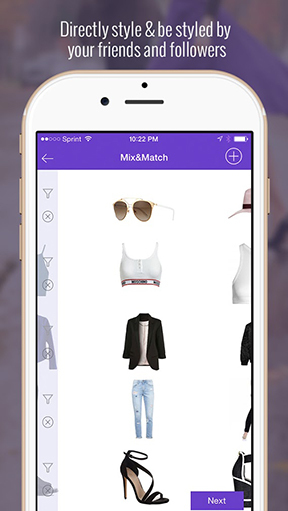 Create a highly targeted digital campaign focused on users who are already fans of similar fashion apps in the relevant social media channels with compelling offerings that pull them into Swggr. 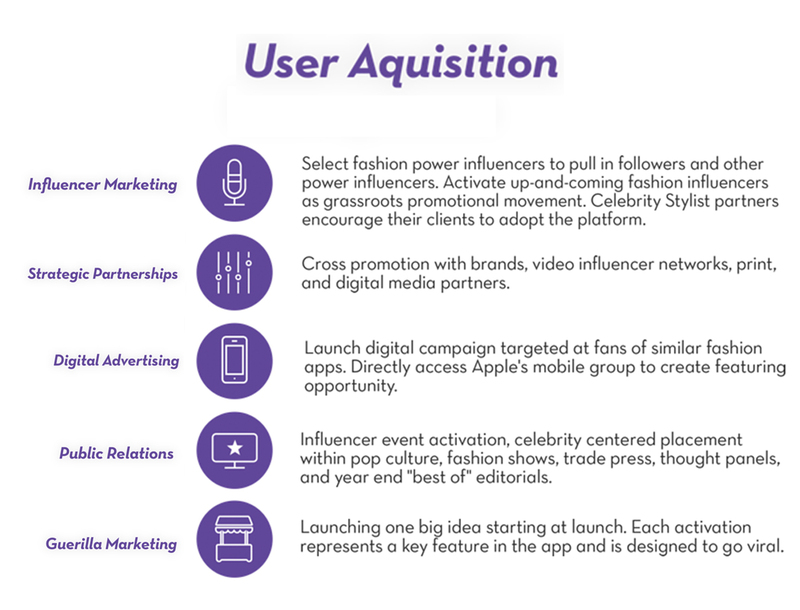 Enlist a select group of fashion power influencers with a small equity offer stake to strategically promote Swggr, pulling in their followers and other power influencers. 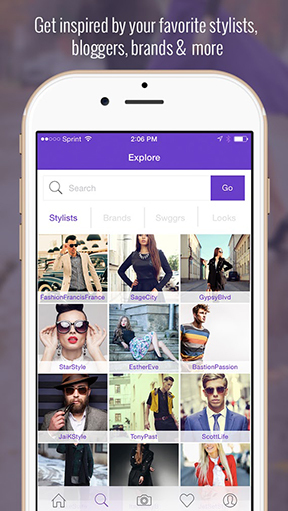 Access celebrity stylists to adopt the platform and pull in their client base in exchange for special featuring within the app and user communication. 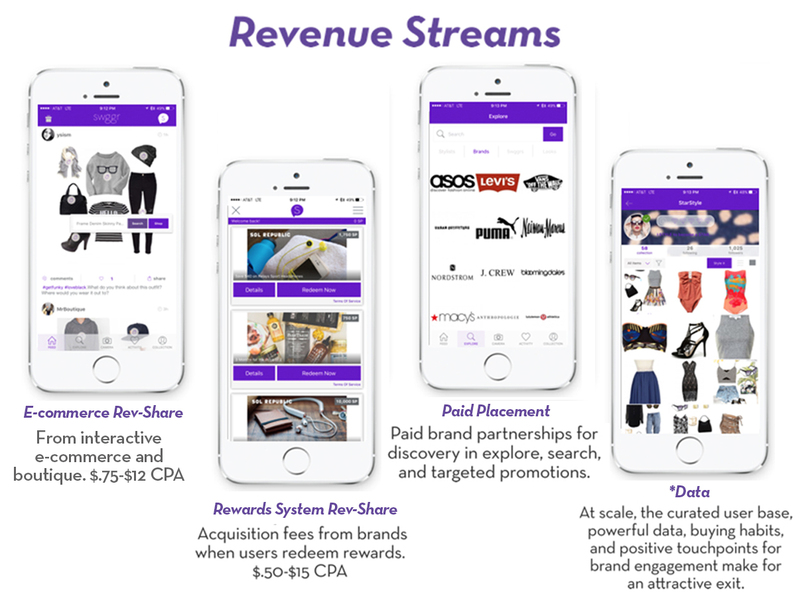 Create cross promotional opportunities with brands, paper and digital magazines, Youtube influencer networks and agencies that leverage real estate/promotions within the app that enhance their mobile reach for strategic promotion. Centered on a celebrity as a hook across all pop culture mediums, also placement within fashion and trade press, year-end best of lists and editorials, thought leadership panels when appropriate, press and influencer oriented launch event. A heavy deployment of the above activity and resource will take place in the first 30 days of launch, to create buzz/momentum and leverage our direct Apple relationships to increase the potential for featuring within the App Store. Can the items on Swggr be purchased? There are millions of items in our boutique which will be fully purchasable, items that are added by users will not be purchasable at launch. Swggr is a playground for expression and sharing first (allowing us to gather powerful user data), an ecommerce environment second. 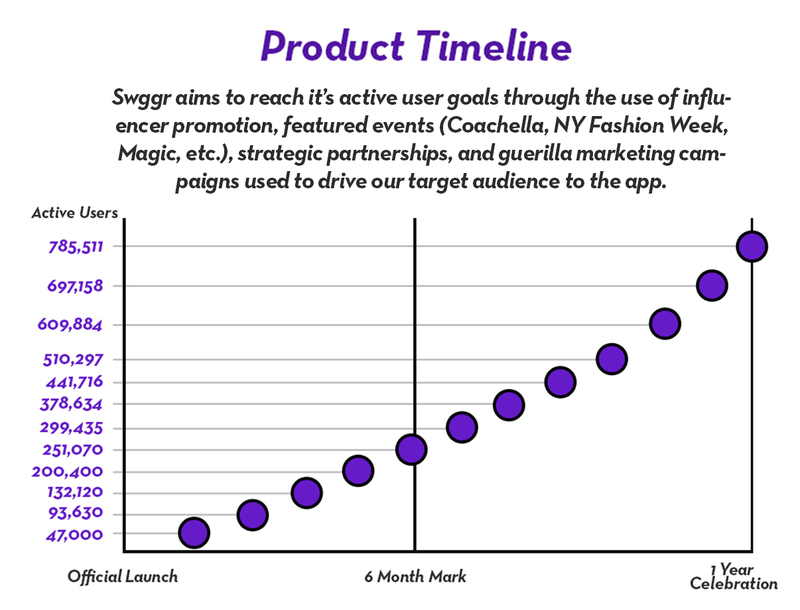 How will the brands and products become available on Swggr? And how will they be curated? 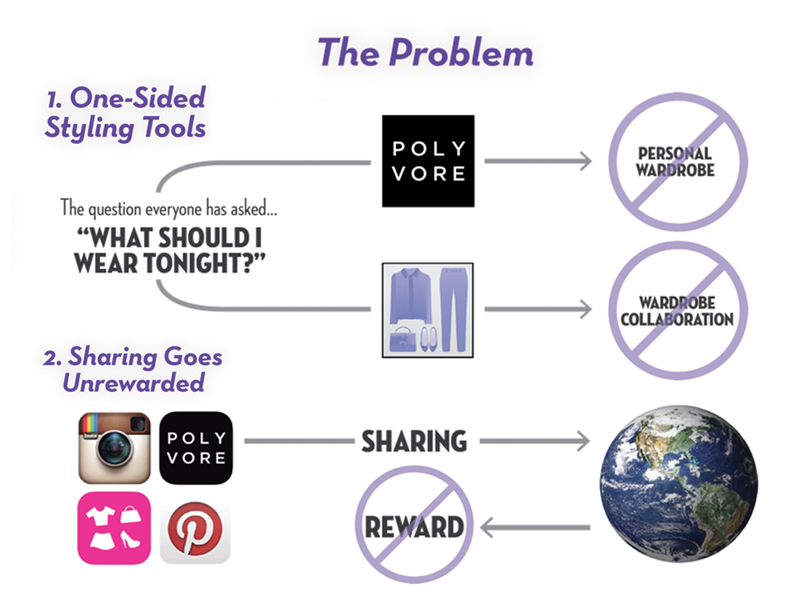 There are several brand access points: Our affiliate partner Viglinks gives us immediate access to thousands and thousands, our rewards partner Lootsie has dozens, we have a top flight agency who will join us pre-launch, a Style Director with deep roots in the community, and our own network of relationships to tap into. Brands and products will be curated by our Style Director, a small creative support team, and a select group of retail partners. Enter your name and email, and we’ll let Swggr know you’d like an introduction. You will now receive updates for Swggr.